Production has now begun on next year's season of Doctor Who (following the hiatus it took during 2009) and the BBC has published the first photo of Matt Smith in full costume. Smith will be the next actor to take on the iconic role of the Doctor (taking over from David Tennant). Next season's Doctor Who will be the first with new showrunner Steven Moffat at the helm. If that name doesn't ring a bell, I probably only have to mention that he wrote the previous episodes "The Girl in the Fireplace" and the "Silence in the Library"/"Forest of the Dead" two-parter and that should be enough to make you swoon with eager anticipation. Can't wait to see the Doctor's newest adventures in time and space when they begin again next spring! 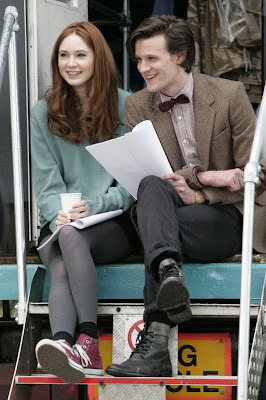 Moffatt also wrote The Empty Child & The Doctor Dances (season 1) as well as Hush. I'm looking forward to seeing what he can do with the series.